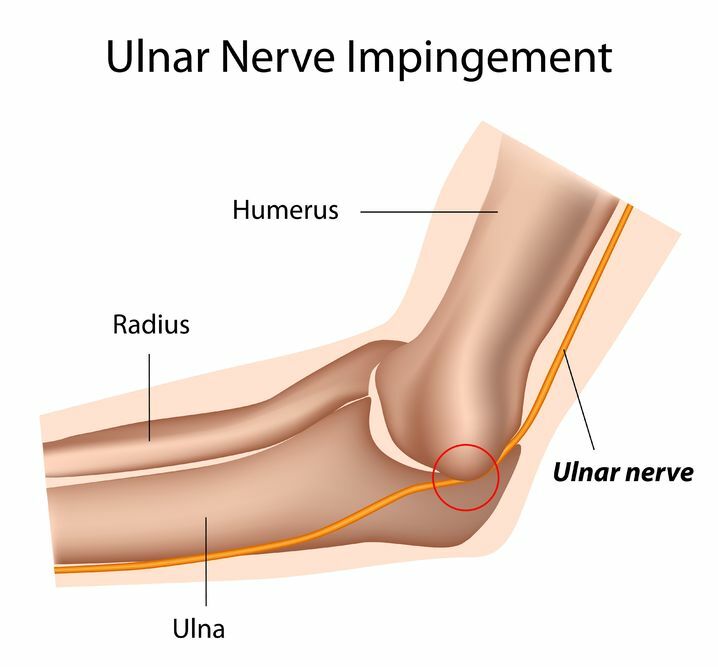 Tips for Ulnar Nerve Pain. If you have constant tingling or pain extending from your elbow to your Little and Ring finger, you might have a Ulnar nerve entrapment. Placing ice directly on the Ulnar nerve at the elbow can cause Ulnar nerve palsy. Use a thin barrier between the ice and your skin. Nerve stretching exercises can restore normal nerve movement (gliding) and reduce symptoms most of the time. Seek the expertise of your Physical Therapist and allow them to educate you with the proper do’s and don’ts. Have you ever hit your funny bone? Oddly enough, it’s not that funny. Normally you experience tingling and pain that extend down your arm to the Ring and Little finger. These painful, tingling sensation is brief but bothersome. For some people, these or similar sensations are felt continuously. This condition is cause by some kind of compression in the Ulnar nerve and is sometimes referred to as Ulnar Nerve Entrapment. Physical Therapy can help correct the condition, but sometimes surgery is required to move or transposition the Ulnar nerve. The Ulnar nerve originates from the neck and Brachial Plexus and courses downward through the arm. As it passes through the elbow joint, it is protected by a bony prominence (medial epicondyle of the Humerus) and covered by fascia and skin. It leaves the elbow and continues distally through the forearm and eventually into the hand. Along its path, it innervates various patches of skin and muscles. Most of the time, this nerve functions normally throughout our lives due to the protective anatomical placement. In the case of some people, the nerve can get irritated, damaged and entrapped. They may require Physical Therapy to address the symptoms. If that fails to bring relief, they may require surgical procedure known as Ulnar never transposition. The surgery is usually performed as an out-patient procedure. The surgeon makes an incision on the area of the elbow that exposes the Ulnar nerve. The nerve is carefully moved or transposed from the back or posterior aspect of the medial epicondyle to the front or anterior aspect of the medial epicondyle. The nerve is placed under, through or on top of the muscles of the forearm. Physical Therapy can begin immediately following the surgery. During the first two weeks, therapy focuses on reducing pain and swelling by maintaining motion in the shoulder, wrist and hand. The motion in the elbow might be limited by the surgeon for the first couple of weeks to allow the Ulnar nerve to “calm down” following the surgery. When the doctor has given the ok, the patient’s elbow can be moved through the full range of motion, and a strengthening program can be started to regain full function of the involved arm. Pain: While pain tolerance differs greatly from patient to patient, nerve surgeries are generally painful. Patients experience the most intense pain within the first two weeks of the surgery. Pain is managed with medication, ice, and therapy. One helpful way to reduce pain is through gentle motion and exercise appropriate for the acute post op phase of healing. There is considerable swelling and inflammation throughout the elbow joint. There might be bleeding from the suture sites, but this should be minimal. Bruising might occur in the area of the surgery and extend into the forearm. Gentle message to this area can reduce the sensitivity. Wearing a sling: The patient will have to use a splint on the posterior aspect of the involved elbow for a couple of weeks. The patient will use a sling to support the arm while a splint protects the arm. Sleep: Sleeping is difficult for most surgical patients. The ability to get “comfortable” and sleep is a huge challenge. Some patients are instructed to wear their sling while they attempt to sleep. Lying on the involved side usually does not occur for several weeks/months post op. Driving: Returning to the driver’s seat is determined in part by which arm is involved and in the sling, if the transmission is automatic, and if the patient has quit taking narcotics. The doctor ultimately determines when you are ready to drive. The active use of the R UE will be limited for several weeks. If you feel comfortable driving with one arm and the involved arm grasping the steering wheel at the “6 o’clock” position, then you can usually begin driving within the first 2-3 weeks. Returning to work: Depending on the type of work, you could return to some aspect of your work within the first two weeks. If your job is physical, you’ll have to discuss a return date with your doctor. Based on the progress of your surgically-corrected arm, the surgeon will determine when you’re capable of returning to work and in what working capacity. Having fun: Returning to hobbies, recreational sports and all leisure activities will be determined by the doctor and physical therapist. The more physically demanding activities can take 3-6 months to return to. The repair must heal and the strength must be developed to handle the demands of the activity. Physical Therapy is a major aspect of the rehabilitation process. The Physical Therapist will design a rehabilitation program utilizing the doctor’s protocols that will regain the motion and function of the involved elbow. The Physical Therapist can mobilize the elbow and educate the patient on particular exercises that will help restore the motion and natural glide of the nerve. If the nerve gets “stuck” in scar tissue, symptoms similar to the ones that were present pre-operatively can develop. so it is imperative that the nerve is stretched slowly, gradually and consistently to re-develop pain-free, symptom-free functional motion.